The advantages of using public transport are generally synonymous but wider than the advantages of using pooled transport (where people get together to undertake the same journey together, in the same vehicle). There are benefits for the greater good, such as environmental protection; and for personal gain such as increased safety. Reduced damage to the environment. One bus emits far fewer fumes than twenty cars (especially if it uses LPG fuel). Train emissions of CO2 "per passenger/Km are, on average, approximately half that of travel by car"1. Reduced use of fuel. "In 1999 UK road transport consumed 80 times as much energy as rail, while the distance travelled by road passengers and freight was only 15 times as much"1. Buses and trains are safer than cars2. You are 9 times more likely to die travelling by car than by rail1. Reduced time spent on maintenance of personal vehicles. No need to find parking spaces at your destination. Some people hold that public transport acts to "provide a social service for the poor [but rail] passengers are in fact overwhelmingly middle-class"4. This is probably due to the massive benefits of making daily commutes in pooled transport, therefore meaning many businessmen and workers use it. Passenger travel aside, there are also benefits for increasing the rail network in general. Traintracks use up less space than roads, are more easily concealable so cause less visual disruption, and with increased rail coverage comes increased freight. "Carrying freight by rail results in an 80% cut in CO2 emissions per Kilogram carried compared to road haulage" and can replace 50 lorry movements1. This is a massive environmental and commercial saving. The cost to the environment is something that affects everyone. Economic concerns dictate that for future prosperity we must invest now, in a greener future. An initial cost will prevent massive costs later. Combining that with the freight savings of rail, it makes sense for governments and citizens to support the rail system. There are additional advantages to saving on fuel usage, aside from the benefits to the environment. Politics and oil supplies are often uneasy bedfellows: by reducing fuel usage, we are making our country more independent of the major oil-supplying countries who sometimes disrupt our lives by restricting oil. If oil consumption dropped, then it will be less effective to use oil supply as a political weapon. Open transport does not afford the same level of personal space or protection as a private care (especially psychologically). Public transport is organised around fixed timetables, meaning that it is not always the practical way to travel due to conflicting arrangements. Hardy-bodied people may be able to carry luggage over public transport, but on many occasions private transport is easier. Better for the environment and safer, public transport is the best option, when available and practical taking into account the nature of your journey, whether you can organise a day around fixed timetables, and whether you are feeling sociable: Weak-minded and frail persons may struggle carrying things and feel too insecure. 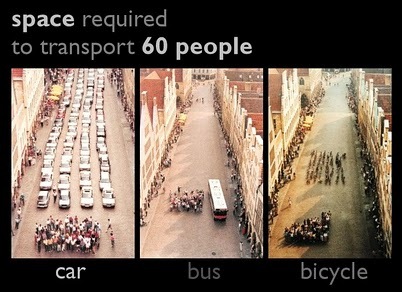 Pooled transport should be used whenever it can be: the advantages to the world are too great for it to be overlooked for minor reasons. Personal transport should be used as a last resort.